Four months into the year and I have only just closed the book on my first read of my 2017 Reading Challenge. Having been unwell I have neither had the energy or focus to read a book, flicking through a magazine was the best I could manage until recently. I picked up and read my first book of the year in April - yay! If you love the Rainbow book mark in the photo above then keep reading as I have a giveaway for you to win a handmade crochet bookmark from Nell Makes. So, onto my first book of the year, V The Second Generation by Kenneth Johnson. Some of you may recall a science fiction tv mini series in the 80's called V. An alien race that look human visits earth in 50 huge mother ships asking for help and in return they will exchange medical advancements and healing the earth of the damage caused by humans. But it soon becomes apparent the visitors are more reptile than human, and are here to harvest the earth of its vital resources including humans. I read the book of the mini series back in the 80's along with many of the subsequent follow on books. I even have the dvd of the tv mini series. Can you tell I really enjoyed V! So when I realised Kenneth Johnson had written a sequel I was eager to find out how the fight for earth had gone. I should say that you do not have to have read the original book to enjoy this book. The book is set 20 years on from when the Visitors first arrived at Earth. The fight by earths resistance army continues but they have suffered significant set backs over the years. The visitors have raped the planet of its water, oceans have been depleted travel harbours and ports around the globe are unusable. A new generation of humans know no other life than Visitors occupying earth, they work alongside them. A new species of humans and visitor children have grown up, half breads or 'dreg' they are disliked by many humans and visitors alike - but can they unite the two species together. There are plenty of new characters in the book and also some of the original characters both resistance and visitors that I loved to hate. Can a message sent out to space by the resistance on Earth make a difference to the fight they face 20 years later. As the saying goes 'My enemies enemy is my friend...but are they. Never one to give too much away as I would not want to ruin any book for someone. I will say yes the fight continues and you will be drawn into resistance plans to save Earth and the human race from destruction. This book is a great sci fi read, if you have not read the original 'V' book I recommend it you do not need to read it before the Second Generation book but you will enjoy it all the more. You will also not have to wait 20 years to read the sequel. Having finished the book I was surprised to read some of the negative reviews it received, totally uncalled for in my opinion. I scored this book 4/5 on Goodreads. I am just starting my next book, which has been languishing on my bookshelf for a few years. I have no idea how my reading challenge will progress this year, but I am just going to read and enjoy what books I can, when I can. As a way of celebrating ticking the first book of the year from my Reading Challenge, I am running a giveaway. You have the chance to win a handmade crocheted bookmark of your choice from my talented friend Nell Makes. I have been using one of her colourful and cute Rainbow bookmark clips, not only in my latest read but also in my bullet journal, and whilst doing some holiday planning and research. They are just the cutest bookmarks made up of tiny crochet stitches. Nell Makes has created a range of beautiful crocheted bookmarks, not only the wonderful and colourful rainbow bookmark (my favourite) but also other fun designs - an owl, unicorn, watermelon (I carried a watermelon, yes are you saying that too!) and more. If you want to buy one or see her other designs please do visit Nell Makes Etsy page or Nell Makes Facebook page where you can also see the many other some beautiful crocheted items she makes along with felt greetings cards. Giveaway time! 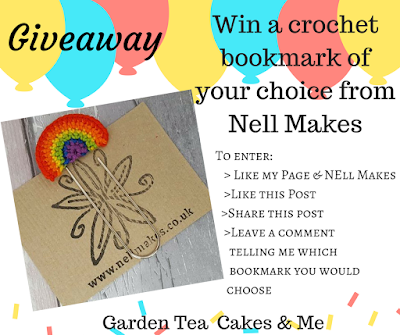 To win your choice of crocheted bookmarks from Nell Makes I have a competition running on my Garden Tea Cakes and Me Facebook page, so be sure to pop over and enter today. You can keep up to date with my past and present reads by visiting my Goodreads page, see the link in the sidebar on the right hand side of your screen. Have you read any good books of late?